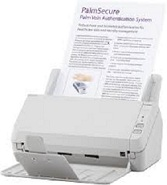 Fujitsu SP1125 Scanner Evolve from your physical to electronic documents with digital ease with the SP Series. Create one single source reference for all your data by merging these with your digitally born documents. Gain the business advantages of working with more convenient, flexible and secure digital images using simple push button routines, the SP Series feature a simple operation panel with only 2 buttons (Scan / Stop and Power) as well as software enabled push button management. The SP1125 scanner's Desktop convenience: Measuring only 298 x 135 x 133 mm (W x D x H), the compact design of the SP Series models takes up minimal space on a busy desktop. Trade a small desktop space to reclaim a much larger space taken up by paper records. Versatile. Entry point into professional document management. Resourceful. Purpose built with impressive software suite for efficiency gains. Reliable. Intuitively and dependably converts physical documents to digital format. Convenient. Simple and easy to use design, ideal for desktop placement.